Lynn Lane is possibly one of the most recognized and friendly faces of Charlie Johns Store. She is married to Jonathan Lane, owner of the store. Lynn grew up in the local area and began working at Charlie Johns in 1997, after graduating from college in Potsdam, NY. 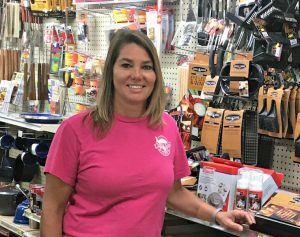 She started as a cashier and general merchandise clerk, but quickly picked up on the duties of the other departments, always willing to fill in wherever needed. In 2001, Jonathan and Lynn married, and throughout the years, Lynn has played a part in almost every aspect of running the store – from stocking shelves and cashiering to bookkeeping and ordering merchandise. Today, she plays a significant role, partnering with Jonathan on day-to-day operations and helping with business decisions. One of her main focuses is overseeing the large General Merchandise Department and the seasonal Outdoor Lawn & Garden Center. This is truly one of the unique aspects of Charlie Johns – the huge array of products and supplies offered in addition to everyday groceries. The list of available merchandise is too long to list here, but includes hundreds of items including cookware, houseware, camping & hunting supplies, tools & hardware, art supplies, toys, books, electrical & plumbing items, gifts, clothing, automotive & RV supplies, and seasonal merchandise. Outside of work, she enjoys spending time with their two daughters, Morgan and Bentley, in addition to skiing, snowmobiling, boating, and gardening.